The 14th Annual Shore Fraud Conference will be held on Friday November 16, 2018 on the campus of Salisbury (MD) University. It will be a day-long event providing practitioners with 8 hours of fraud-related continuing professional education. 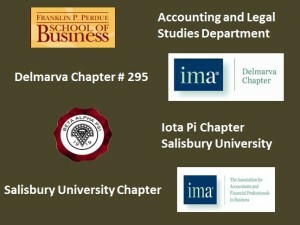 This conference is sponsored jointly by the Accounting and Legal Studies Department of the Franklin P. Perdue School of Business, the Delmarva Chapter of the Institute of Management Accountants, the Iota Pi Chapter of Beta Alpha Psi Accounting Honor Society and the Salisbury University Chapter of the Institute of Management Accountants. This conference came about as a result of the demand by local practitioners for top-quality anti-fraud training which was close to home and reasonably priced. Through the years we have strived to make this a national conference in the sense that we assemble prominent speakers from throughout the U.S. Salisbury University opened its new state-of-the-art, $56 million home for the Perdue School of Business in the fall of 2011. The Shore Fraud Conference will be held in the 225-seat Bennett Family Auditorium, Lounge Area, Executive Suites and Café. We have put together another outstanding lineup of presenters. Mark your calendars now and be sure to share this information with your friends and co-workers. The Conference is NASBA-approved for 8 hours of CPE (NASBA Sponsor #117734). During our early-bird registration period, the cost to attend for all participants is $130 per person. Beginning on October 1, 2018, the cost to attend for all participants will be $150 per person. The Conference CPE will consist of 2 hours of Behavioral Ethics, 2 hours of Auditing, and 4 hours of Specialized Fraud Knowledge.